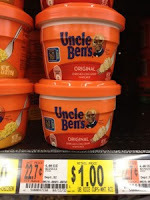 Uncle Ben's Rice Cups only $0.50 w/ Coupon! You can get a great deal on single serve Uncle Ben's microwaveable rice cups at Walmart! = $0.50 each wyb 2!